Keeping fish is a fantastic hobby and one which can take many years to master. When you start out it can feel overwhelming and it’s easy to make mistakes. From overfeeding fish and wrong aquarium types to nitrogen cycles, as a fish keeping enthusiast it can sometimes feel overwhelming when starting out. There are also lots of myths about fishkeeping floating around: such as fish only grow to the size of the tank and Catfish will keep your aquarium clean. In today’s article we are going to look at the 8 most common beginner fish keeping mistakes. It’s important you understand what these mistakes are and how you can avoid making these mistakes to keep your fish safe. So, continue reading as we share the eight most common mistakes new fish keepers make. How do I avoid this mistake? Perhaps the biggest mistake I see beginner fish keepers make is buying their tank first. This is an absolute no. They might see a used aquarium listed on craigslist for $25 and be very tempted! So, they decide to buy the aquarium and then, later on, they think about which type of fish they would like. Each species of fish requires a very specific environment to live in. 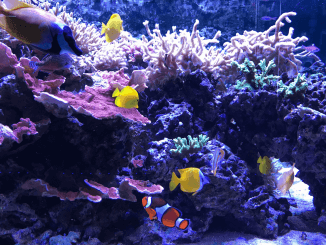 At a basic level, you have either freshwater or saltwater tanks. You can then have more specific requirements such as size, filtration and heating. If you buy the tank first you are potentially eliminating lots of fish types because the tank won’t be suitable. You should always start by thinking about the fish you want to keep first. This way you can choose the fish you want to keep and then work backwards and select a suitable tank for them. For example, if you only want to raise Oscar fish, you would generally need at least a 100 gallon tank. If you have already bought a used 40 gallon tank, then you wouldn’t be able to raise Oscars and would have wasted your money on an aquarium which is too small. As a newcomer to fish keeping, you can be forgiven for thinking that all fish are friendly and can live in harmony with each other. You will soon realize this isn’t the case. 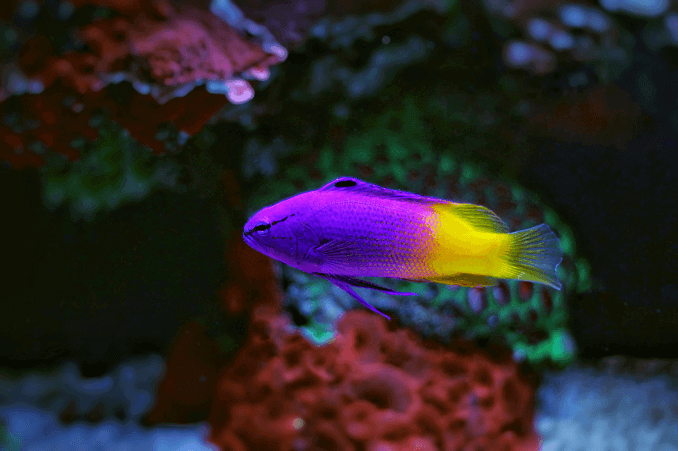 For instance if you mixed a Royal Gramma with a Royal Dottyback, you will definitely have trouble. In fact, you will be lucky to still have two fish alive after placing them in the same aquarium. This is why when you are buying fish for your aquarium you should always check their compatibility. Some fish are so aggressive you can’t even have two of the same species living together (e.g. Bettas). Not only are some fish just incompatible because of aggression, they may also be incompatible because of the environment they need to live in. You would not mix an Oscar with a Royal Gramma. This is because Royal Grammas require saltwater, whereas Oscars requires freshwater. Most pet stores will have a compatibility list you can check before you buy the fish. If not make sure to check online that the species of fish are compatible before you visit the store. Apart from over feeding fish, misjudging the tank’s nitrogen cycle is the biggest killer of fish with hobby aquarists. What generally happens is the nitrogen cycle stalls, due to a lack of beneficial bacteria, this causes a buildup of ammonia and can be lethal for your fish. When fish create waste, it causes a buildup of ammonia inside the tank. Your beneficial bacteria then brakes down this ammonia and create nitrite. Unfortunately nitrite is also toxic to your fish, so again the beneficial bacteria are needed to break down the nitrite into nitrate. At this point when the nitrate levels spike you then need to perform a water change as the beneficial bacteria cannot breakdown nitrate. What you see in this cycle is a spike and decline in ammonia, then nitrite and finally nitrate. It’s your job to ensure this cycle is maintained and continues through beneficial bacteria and water changes. To complete a nitrogen cycle you need beneficial bacterial in your tank. You should test your water each week and when the nitrate level spikes, change your water. Typically you will be changing your water every 1-2 weeks. But not all of the water! See Mistake 5. Whilst I’m hesitant to call this an outright mistake, it is a problem which beginner fish keepers run into frequently. First time fish keepers will generally buy a very small tank, just to check if they enjoy the hobby. It’s an affordable way for people to start fish keeping. Large tanks can be very expensive and complex to set up which can be daunting to a beginner. So a small tank is a good start. However where this fails, or goes wrong, is when people buy a small tank yet fill it with fish that need a larger aquarium. A classic example of this is the common pleco. They tell themselves that as the fish grows they will purchase a larger tank and move the fish. However, in reality, this rarely happens. People are busy and rarely replace the tank. Then before you know it you have 4 Oscars in a 40 gallon tank. The Oscars will live but the confinement will hurt them and severely shorten their life span. If you intend to get fish that need a large aquarium, buy the correct size tank from the start. Don’t fall into the trap of buying a smaller one now with the intention to replace it at a later time. If you can’t afford a large tank now, I would recommend selecting another type of fish which can comfortably fit into an aquarium you can afford now. 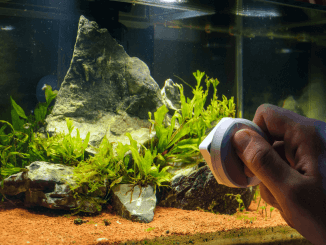 Another common beginner mistake I’ve seen happen is when it comes to cleaning the aquarium. During the cleaning stage they remove all of the water out of their tank. This will almost certainly kill your fish. 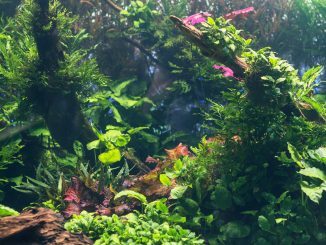 If you change too much water at once, you will destroy the beneficial bacteria and ecosystem which has built up in your tank. Without these beneficial bacteria you will create a spike in ammonia which is toxic to your fish. Instead of removing all your water, you should only remove around 15%-20% of the total water in your aquarium. This helps to keep both the pH level and temperature within safe thresholds for your fish and keeps nitrate levels within a safe threshold. Also, remember to treat the new water before you add it to your aquarium. You can use a water conditioner to remove any harmful chemicals in tap water such as chlorine. Finally, make sure to test the key water parameters (pH, ammonia and nitrate) before and after every change of water. You can do this using a water test kit. “Fish only grow to the size of the tank”. Let me state this here: it is entirely false; fish do not only grow to the size of their tank. I believe this myth came from a generalization about goldfish. It’s a commonly held belief that goldfish only grow to the size of the aquarium they are placed in. This is partially true. 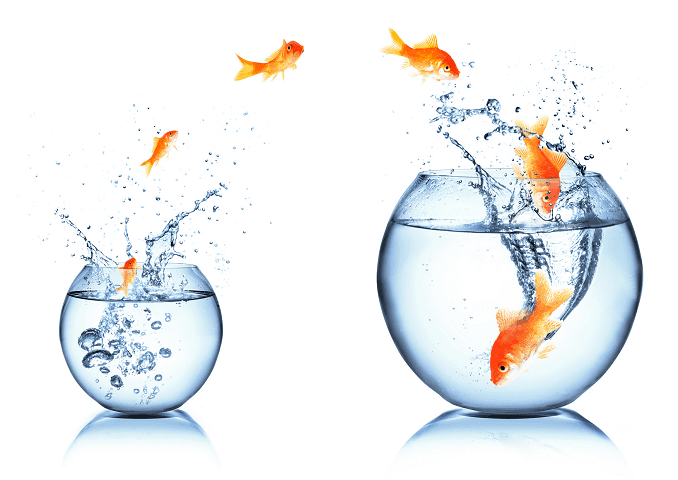 Goldfish are known as indeterminate growers; this means they continue to grow until they die. However when they are placed in a small aquarium with poor quality water, their growth is stunted. So they ‘appear’ to fit the size of the tank, however in reality their growth is stunted and their health is severely damaged because of this. People then extrapolate this goldfish myth to all fish types, so they think that all types of fish will only grow to the size of the tank. 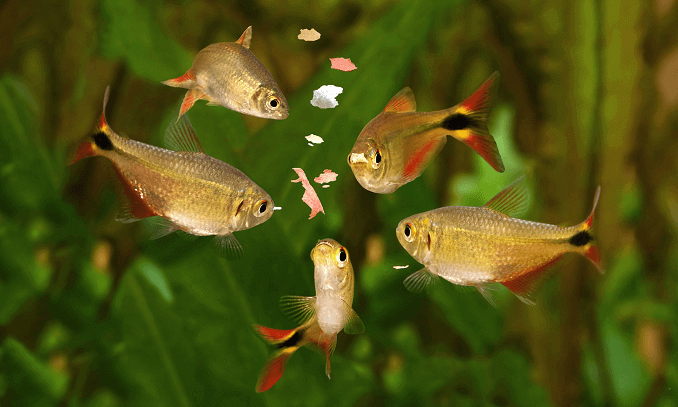 All that’s really happening is your fish’s growth is stunted and you’re permanently damaging their health. You must make sure that your aquarium is big enough for the fish you choose! Thoroughly research the specific fish’s requirements and make sure to increase the tank size if you are buying a shoal. Most reputable fish stores won’t let you make this mistake. However, a more generic pet store, or fun fairs with fish stands, could allow it to happen. 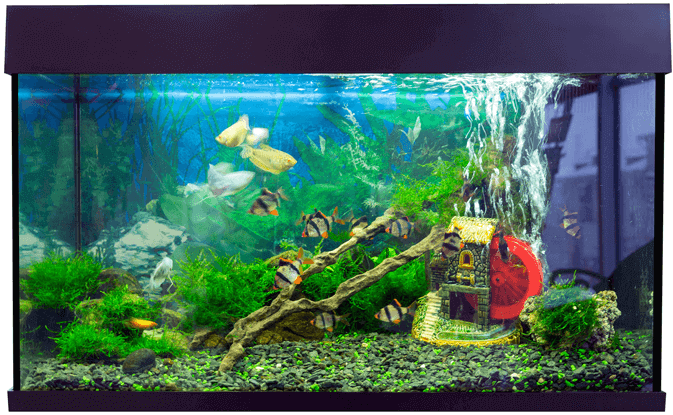 Before you place fish in your tank, you need to ensure that your aquarium has beneficial bacteria. This beneficial bacterium is needed to create the nitrogen cycle we spoke about earlier. Without this, your fish will certainly die due to a spike in ammonia. At the very least, you need to allow 2-3 days before your tank is safe for fish. So to ensure your fish’s health, you need to prepare the tank first and then once it’s suitable for the fish, you can then bring the fish home. You can check if the tank is ready by performing a water test. At many carnivals and fun fairs it’s common for a goldfish to be given away as a prize. Unless you have a pre-prepared tank it’s very likely that the goldfish will die when you take it home as the water won’t be ready. Clearly the only way to avoid this is to purchase a suitable aquarium in advance. You can then introduce beneficial bacteria and continue to monitor and measure the key water parameters (i.e. pH, ammonia and nitrate). Once the tank is suitably set up you can then introduce the fish into your aquarium. Without a doubt, over feeding your fish is the single most common cause of death. It can be tricky for beginners to not overfeed their fish because they always look hungry! And in their natural habitat, fish will spend large periods of their day searching for food. Why is overfeeding them so bad? The main reason is because it creates excessive waste. First of all, the uneaten food will stay in the tank and create waste. And second, an increase in waste produced by the fish is triggered by a higher intake of food. This excess waste can cause deadly changes in the chemical composition of the water in your aquarium. Also, when fish overeat, it can cause health problems such as fatty liver and improper digestion. A good rule of thumb is to only feed your fish what they can comfortably eat within 5 minutes. You can decide whether to feed them this amount in a single feeding, or whether to spread this out over 2 or 3 feedings per day. However, you must make sure that the total feeding time isn’t over 5 minutes. We hope that explaining these beginner fish keeping mistakes will prevent you from making them when you start keeping your own fish. Without a doubt the three most common mistakes are overfeeding, the fish will fit the tank myth and not understanding the nitrogen cycle. If you remember these three key things you will be starting your fish keeping hobby in a great position. Finally, make sure that before you start keeping fish you have researched the topic thoroughly and have chosen the species of fish you want to keep. Then work backwards form there! My daughter bought me a bata Crowntail for Christmas they sold her the fish and aquarium the same day with a bottle of conditioner and a pack of food! I love it but only told her to float the fish in bag for an hr befor letting it go! We did as they said and looked up about them later! The tank needs to be 10 gallons this is one gallon, you need to prepare tank two days in advance! No water test kit recommended high intensity light not good! No heater! Said to keep at 70 on line says no colder than 72 to 76? Bulging eyes on fish they sold has constipatikn issues! Sooo sad! What can l do for him?